Be sure to tell them "don't you come around here" once you're inside this Adult Beat It Deluxe Red Zipper Jacket! 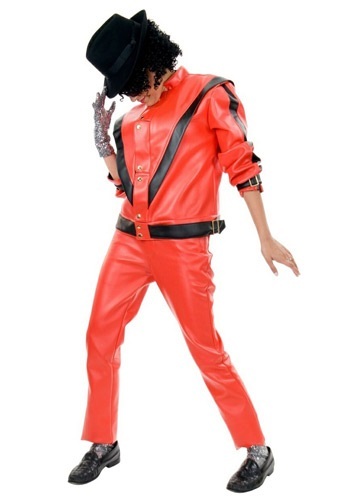 This makes the perfect costume or ultimate gift for any Michael Jackson lover! Because you're bad, you're bad, really really bad. 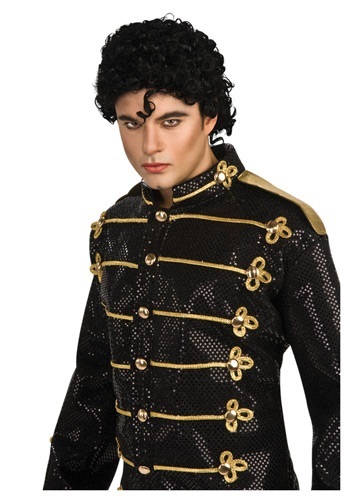 Well, you WILL be after you get into this adult Michael Jackson Bad jacket. It's the look straight from the classic music video. So whether you're heading out for Halloween or the karaoke bar, we think this is going to have everyone singing along and dancing to one of Michael's biggest hits. There is only one King of Pop and it will forever be Michael Jackson. He moonwalked his way into music history with unforgettable songs, inimitable dance moves, and of course by the way he dressed. This Michael Jackson Black Military Jacket is just like jacket he wore to many of his concerts and appearances. It's covered in glimmering sequins, so you too can stand out from the rest just like Michael. Now all you gotta do is practice that fancy footwork and you'll be ready to take the stage and bust out some Smooth Criminal karaoke. Michael Jackson was always a snappy dresser, and this sash is no exception! This Michael Jackson sash is a quick and easy yet awesome addition to your costume this Halloween. Cue the music, because you're about to bust out an epic Moonwalk that would even impress Michael Jackson himself! But to really pull it off you need some showmanship, the kind nobody has ever dared. Wearing two gloves? Totally ordinary, but when you wear one, it's going to really stand out. Now, cover that one glove with jewels and you've got an iconic piece of history literally on your hand. This Michael Jackson glove is the key to pulling off the King of Pop look. 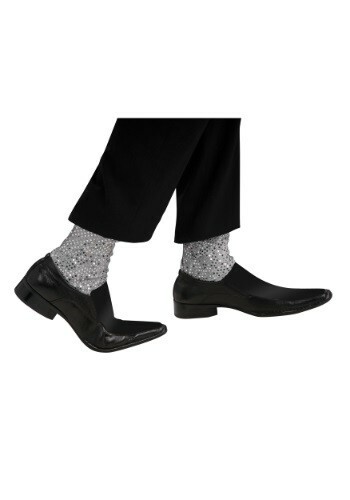 These Adult Michael Jackson Sparkle Socks recreate the classic popstar look. 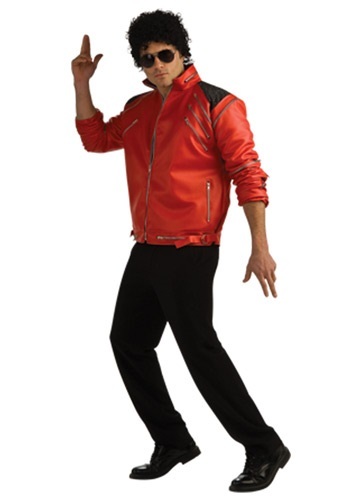 Embody the one-gloved King of Pop with this Adult Michael Jackson Thriller Jacket! Wear it with our matching Adult Michael Jackson Thriller Pants for a complete look. Re-create Michael's classic 1983 video! 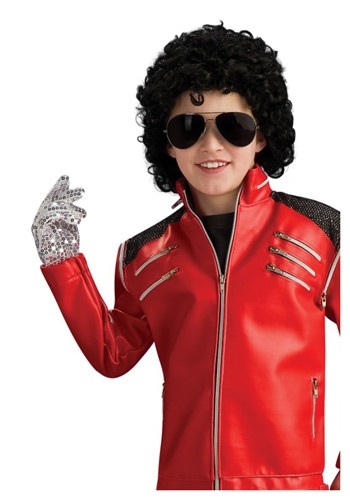 "Just Beat It, Beat It, Beat It, Beat It, No One Wants To Be Defeated" If your little one loves to dance then they'll love pretending to be the King of Pop in this great jacket. This is a smaller version of the one that was worn in the great "Beat It" music video from 1983. Your young music lover will love taking a trip back to the crazy 80s. The easiest way to become the King of Pop is starting with the silver glove. 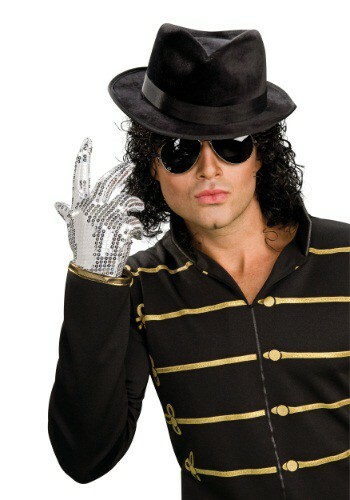 This detailed and sequined silver glove is a great way to begin to build your child's Michael Jackson costume. This is an easy way to turn your kid into a real "thriller". "It's close to midnight and something evil's lurking in the dark, Under the moonlight you see a sight that almost stops your heart..." Back in 1983 the greatest music video ever was created, "Thriller". It featured werewolves, zombies and the spooky voice of Vincent Prince. Since it's first airing it has become a favorite for fans of all ages with people being able to sing it at any time while doing the classic zombie dance. 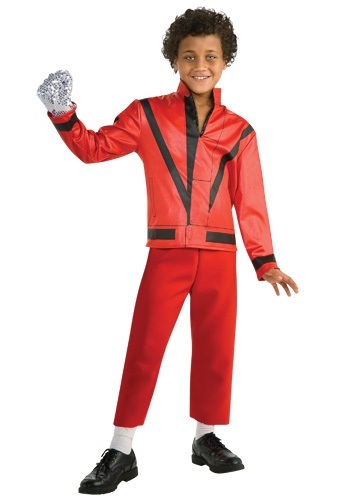 Now you can give your child a chance to look just like the king of pop in his greatest music video! Achieve professional results with this dark cream makeup. You can have a flawless complexion to go with your costume! Been practicing your moonwalk? So have we and we've gotten pretty good at it! Our secret weapon? It's this dazzling Michael Jackson military jacket. You might wonder how a simple jacket can make you a better dancer. Well, it can't. The trick is to look spectacular while you dance, so even if you flub it up a bit, you still look awesome doing it. 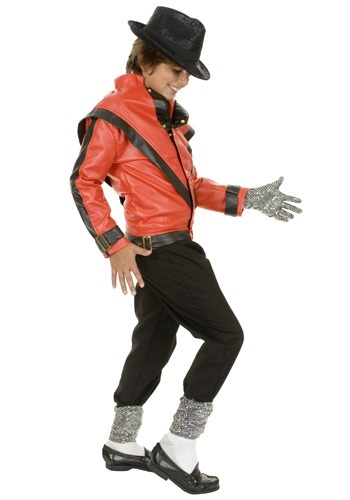 Bring out your inner King of Pop with this licensed Kids Michael Jackson Thriller Jacket! Start a Thriller flash mob, or just be the kid that gets the most candy this year due to your ability to replicate a perfect moon walk dance. 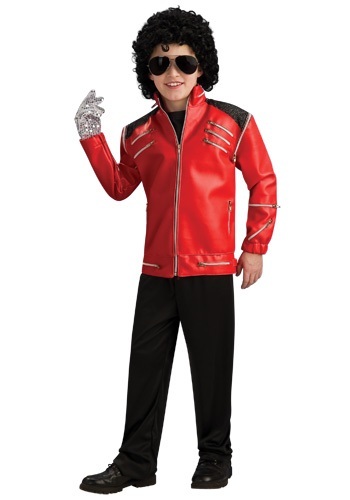 The only downside to wearing this Kids Michael Jackson Wig is that everyone is going to request the moonwalk. Start practicing because it's sure to happen! Like seriously. We tested it. Does your little one love to dance around? Maybe even do the moon-crawl? Then your tiny tot may just be the next king of pop. So put on those classic '80s tunes and let your baby groove in this Michael Jackson Romper. Even Michael had a few bad hair days ... Remember the hairspray incident? 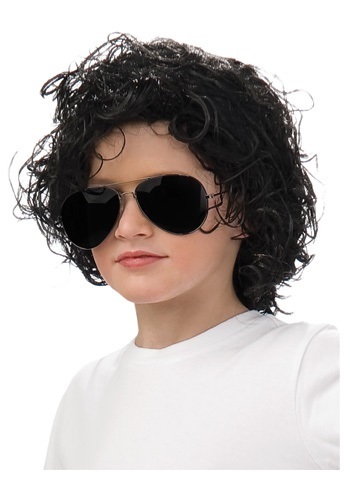 Keep yours to a minimum with this Michael Jackson Wig. Now you can focus more on dancing and less on fly aways.